If there is one figure connecting nearly all of the English composers of WWI it is Ralph Vaughan Williams. He seems to have known almost all of them, and was a close personal friend of George Butterworth in particular. A little older than many of the other musicians who fought in WWI, he was already considered a leading British composer with two symphonies, an opera and a considerable body of orchestral music and songs already to his name, not to mention his roles in the English Folk Song Revival and hymnology. His second symphony, A London Symphony had received its first performance in 1914, and he had begun preliminary sketches of what is now probably his most famous work, The Lark Ascending, which is sometimes interpreted as a piece about the war. The outbreak of the war on 4th August led Vaughan Williams to abandon all composition for the duration of the conflict. He enlisted as a Private in the Royal Army Medical Corps (Territorial Force) on New Year's Eve 1914. At 42 he was old enough to have been excused service, but the medical corps were often chosen by older, perhaps less fit men who wanted to serve; Maurice Ravel, who had tutored Vaughan Williams in orchestration in 1907-8 also became an ambulance driver. Becoming a medical orderly was not an easy posting, however. Medical orderlies were called upon to rescue wounded and dying soldiers, often from within the battlefield area while under heavy bombardment, sometimes in complete darkness only lit by occasional flares; Cecil Coles, another war composer was killed while acting as a stretcher-bearer. 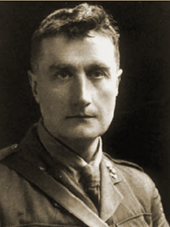 Vaughan Williams served in this role both in the Salonika Campaign in 1915 and on the French Western Front in 1916. Slowly we worked our way along the trenches, our only guide our feet, forcing ourselves through the black wall of night and helped occasionally by the flash of the torch in front. Soon our arms begin to grow tired, the whole weight is thrown onto the slings, which begin to bite into our shoulders; our shoulders sag forward, the sling finds its way into the back of our necks; we feel half suffocated, and with a gasp at one another the stretcher is slowly lowered to the duckboards. A twelve-stone man rolled up in several blankets on a stretcher is no mean load to carry when every step has to be carefully chosen and is merely a shuffle forward of a few inches only. Ralph Vaughan Williams' service as a medical orderly only formed part of his war service; in 1917 at age 45 he was commissioned as a 2nd Lieutenant in the Royal Garrison Artillery, which were responsible for the 60 pounder "big guns" firing shells towards enemy lines. His deafness in later life is usually attributed to their ear-shattering noise. In his role at the Front, Vaughan Williams also found himself having to undertake other duties, for example he reported in a letter to Gustav Holst in 1918 that he was in charge of moving 200 horses during a retreat. I sometimes dread coming back to normal life with so many gaps...out of those 7 who joined up together in August 1914 only 3 are left - I sometimes think now that it is wrong to have made friends with people younger than oneself. A common thread of WW1 veterans is that they rarely spoke of their experiences, and Vaughan Williams was no exception, but the psychological strain of walking around no-mans' land picking up the remains of men, the endless bombardments and grave news about his contemporaries must have tolled on the composer whose pre-war existence was as a comfortable upper-class artist. It's really wartime music - a great deal of it incubated when I used to go up night after night with the ambulance wagon at Ecoivres and we went up a steep hill and there was a wonderful Corot-like landscape in the sunset - it's not really lambkins frisking at all as most people take for granted". Indeed, the Pastoral Symphony is a quiet, but unsettling work of misty strings and woodwind, the intentionally mistuned Last Post and ghostly solo female voice both seem to drift above the orchestra in passages of great beauty, but also ultimately lacking resolution. Dona Nobis Pacem is a more overt memorial, being a setting of Christian texts interposed with the poetry of Walt Whitman, whose poetry Vaughan Williams set in his first major success, the Sea Symphony of 1910; notably, the 'Dirge for Two Veterans' included in the work was originally written by the composer in 1908. Being performed in 1936, it was perhaps designed to act as much as a warning against another impending conflict as the last. Vaughan Williams can be heard in the 1949 film Dim Little Island, in which he explains his thoughts on music in Britain.